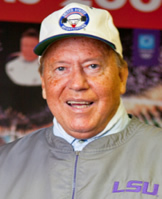 On August 15, 2004, at age 65, Gayle Hatch led the Men’s US Olympic Weightlifting Team as their head coach for the Summer Olympic Games in Athens, Greece. With decades of success as a weightlifting and strength and conditioning coach for some of America’s top athletes, Coach Hatch was the obvious choice to lead our country’s finest competitors. Just as he was the logical choice to serve as head coach of the US team at the 2009 World Weightlifting Championships in South Korea… at age 70. Gayle Hatch has achieved world-class recognition through a life filled with world-class experience. Athletic in his youth, Gayle took advantage of his natural physical talents by testing his boundaries and pushing himself to the limit. His dedication led to success in basketball from high school, through college and all the way into the pros. But along the way to countless awards and recognitions, Gayle learned a great deal about building muscle, strength and character. He learned discipline and what it takes to win, both physically and mentally. And thankfully, Gayle Hatch made the decision to extend the rewards of his own, personal experience to the training of other athletes. At its core, coaching is about improving performance. Good coaches demonstrate a number of qualities including creativity, perception and the ability to inspire and motivate others. Great coaches support those qualities with a strong foundation of practical experience. It’s that winning combination that makes Gayle Hatch one of the most sought-after strength coaches in America. Gayle Hatch embodies a caliber of excellence that can only be achieved through experience. Now 71, Gayle has mastered the art of coaching athletes to their peak potential. And he continues to inspire all of us to keep getting better… and go for the gold. Gayle Hatch… Peoples Health Champion.